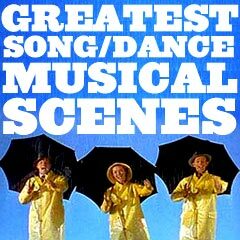 Greatest Song/Dance Musical Movie Moments and Scenes: The following listing (in multiple parts, organized alphabetically) is a collection of many of the Greatest Song and Dance Musical Movie Moments in film history. See also this site's writeup of the Musicals Film Genre. See also AFI's selections of 100 Years...100 Songs and other selections for the 25 Greatest Movie Musicals of All Time. Many of the greatest musical moments were accompanied by a well-staged production number, a lavish set, or a great memorable tune. Though the list appears to be dominated by musicals, other genres were examined and included as well. Exceptional examples of musical films that advanced the development of the genre of music-song/dance are labeled with this symbol. Films that won the Academy Award for Best Original Song are noted with this symbol.